Offering you a complete choice of products which include chequered header grinder. 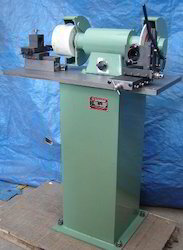 With firm commitment to quality, we are offering a quality approved array of Chequered Header Grinder. The range offered by us caters to the varied requirements of the nail cutter grinding. These machines are widely used to obtain uniform chequers on the nail head. Our range makes the uniform re-chequering and re-facing, much faster and easier.